Nowadays, many people derive great benefits from their ‘doctor Canine’ pets, especially psychological comfort. What’s more, they are also excellent laboratory examiners. 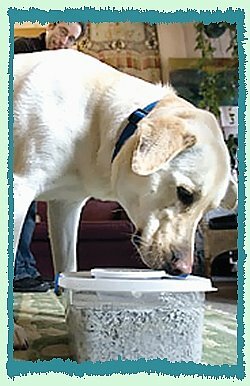 In San Anselmo, California, USA, dogs have been trained to distinguish the breath of patients with lung or breast cancer from healthy subjects. Due to their keen sense of smell, they can pick up the sample breaths with cancer. The scientists explain that certain chemicals are released from the cancer even at its early stage of development. Thus early cancer detection is made possible with the assistance of dogs. In addition to the survey of lung and breast cancers, they can also sniff out skin cancer. A recent news article from Canada reported a woman who found out about her severe cancer through her dog’s behavior. He had been bumping into her right breast repeatedly and fiercely. Finally she was forced to take a physical examination, revealing a 12-centimeter malignant tumor in her right breast. How did the dog know there was something there remains unexplained, but surely we are awakened to the fact that our animal friends may know much more than we humans think.